☞ This site’s purpose is to present info on upcoming & past Kindred Gatherings. ---> Current KG Info: Scroll down or click to see the latest KG information I have. The “Kindred Gathering for Friends of Modes and Dulcimerie” began in 1975, the creation of Robert Force and Albert d’Ossché – a legendary duo of master dulcimerists who helped define contemporary fretted-dulcimer music in the post-Fariña years. I refer to the gathering as a “festival” here in the broad sense of the term (“a special time or event when people gather to celebrate something”). Some who’ve attended the KGs believe that the event should be described only as a “gathering,” not as a “festival” – due to the vast differences between the KG and a typical music festival. Who can attend a Kindred Gathering? 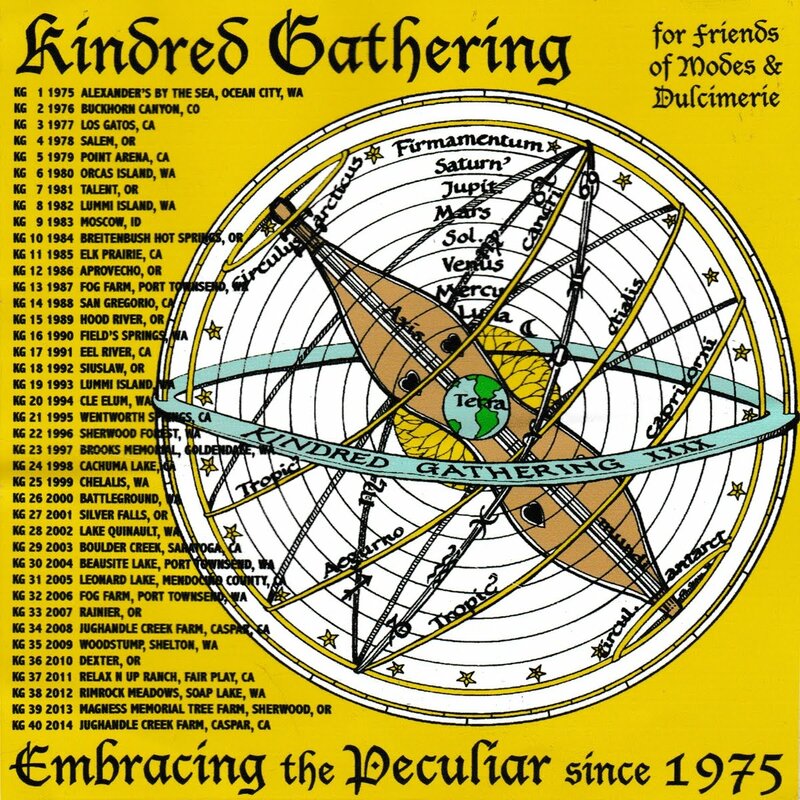 Where does the annual Kindred Gathering take place? The Kindred Gathering is always something new and different ... and fun – organized by different folks at changing west-coast sites every year. In the early months of the year, you can look here to see if I’ve posted info yet about where/when the KG will be that summer. Where do I see a schedule of presentations at the KG? You participate in creating the KG’s user-generated content (not always music-related) – commonly including impromptu workshops, eclectic song circle and open-mic concert(s), spontaneous jams, unnatural acts and anarchic random band scramble. No schedule is planned prior to the gathering. Unlike the two-class system at most music festivals, everyone at a KG is both a star and a student – sharing what they can and taking in what they can. Aug. 10, 11, 12, 13, 2017 ( Thurs. [noon] - Sun. [sundown] ), at Mendocino Magic, Laytonville, CA. - Some files here are available in PDF format. Some may be available in both PDF and JPG format. - PDF would usually be the better format for printing or viewing, unless the fonts and text formatting don’t show up correctly on your system. - When printing a PDF from a computer, the print dialog has a “Page Sizing / Size options” or “Page Scaling” setting. If you’ve never changed its default choice, that setting will be set to a choice something like “Fit to Printable Area” instead of “None” or “Actual size”. But using “Fit” is usually wrong – most PDF files are designed with enough white-space margin. Adding extra margin by default shrinks the page’s content. It won’t look right. You need to change the “Page Sizing” setting to “Actual size,” “None” or “100%” when you print a PDF file that already has a white-space margin. - Some printers allow you to print directly from a flash drive. This may, unfortunately, mean that you’re stuck with the “Fit to Printable Area” choice. For such printers (or if you’d rather not change PDF print settings), there may be special PDF files available with no white-space margin. If you need these no-margin files, use the “PDF[print-area]” links.